Coherent waves that travel along two different paths will arrive with phase shift, hence interfering with each other. Multipath interference is a phenomenon in the physics of waves whereby a wave from a source travels to a detector via two or more paths and, under the right condition, the two (or more) components of the wave interfere. Multipath interference is a common cause of "ghosting" in analog television broadcasts and of fading of radio waves. In this illustration, an object (in this case an aircraft) pollutes the system by adding a second path. The signal arrives at RX by means of two different paths which have different lengths. The main path is the direct path, while the second is due to a reflection from the plane. The condition necessary is that the components of the wave remain coherent throughout the whole extent of their travel. 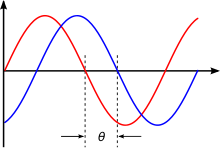 The interference will arise owing to the two (or more) components of the wave having, in general, travelled a different length (as measured by optical path length – geometric length and refraction (differing optical speed)), and thus arriving at the detector out of phase with each other. The signal due to indirect paths interferes with the required signal in amplitude as well as phase which is called multipath fading.